If you're looking for a great resource to teach your students the basics of Ukulele in a fun and effective way, look no further! 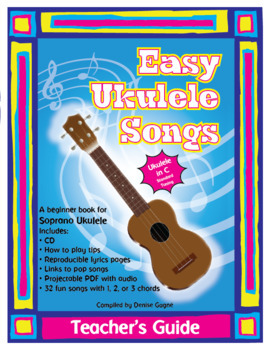 Easy Ukulele Songs Teacher’s Guide is an excellent song collection to teach young beginners to sing and strum on the ukulele. 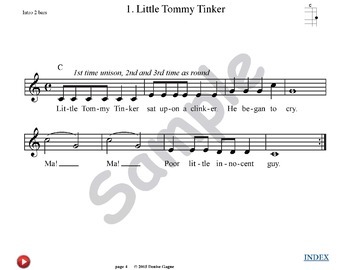 The collection includes 32 folk songs with a performance/accompaniment audio track, as well as projectables, chord charts, reproducible student lyrics pages, and links to easy pop songs to play along with. The first 15 songs use just one chord. Mastering the chords before having to learn to change chords eliminates much of the frustration that young beginners face. After introducing the chords used, 15 easy two chord songs are given. If your students find it difficult to switch chords, divide the class into two groups and have one group play one chord and the other group play the other. Practice changing the chords slowly without looking at the fretboard. When students are able to “feel” where the fingers go, changing the chords will be easy. 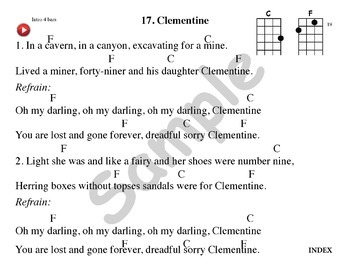 The last two songs in the collection use three chords. Easy Ukulele Songs also includes a ukulele introduction movie and projectable to give your students some fun facts about the history of the ukulele and the basics of the instrument. - What Shall We Do With the Silly Sailor? If you like this resource, check out our second collection: More Easy Ukulele Songs.